The Dens Park club have said they will not be retaining the services of half a dozen players. Dundee have announced that six players will be leaving the club at the end of the season. Rhys Weston, Craig McKeown, Graham Bayne, Ross Chisholm, Jake Hyde and Mark Fotheringham will move on from Dens Park at the end of the season. Of the departures, CEO Scot Gardiner said: ”on behalf of everyone involved with Dundee FC, we want to commend the players for the contribution made to our cause in their time at Dens Park and we wish them every success in the future”. Weston is a former Welsh international who arrived at Dens Park from Walsall, while McKeown joined Dundee in 2008 from Clyde. Graham Bayne has had spells at Inverness, Dunfermline, Ross County and Arbroath, and returned to his first club last summer. 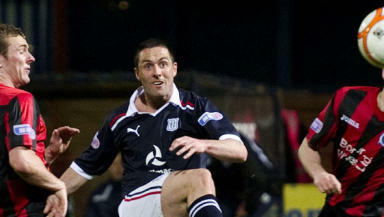 Ross Chisholm also arrived at Dundee last year from Arbroath. Jake Hyde signed for Dundee last year after a brief trial period and cameo at Dunfermline, while Mark Fotheringham only rejoined the club in March after seven years playing in Denmark, Germany, Cyprus and England. Dundee will likely finish the season in second place in SFL Division One.